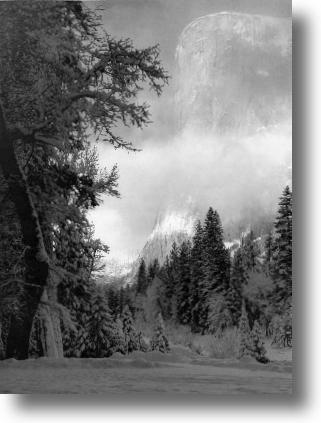 Adams was up at dawn on a cold winter morning driving around Yosemite national park looking for photographs. There was a certain amount of cloud around swirling around the peaks until the sun rose and they cleared. On this day, there was an unusual and fortuitous high altitude haze which stopped the full power of the sun and diffused the light somewhat. Often in bright sunlight with snow, extremely high contrast can be a problem. He positioned himself at one of the classic El Capitan viewpoints, from where the full 3000 feet of the cliff was visible.The tripod was set up in deep snow with care being taken to securely push each of the legs down to a stable layer below so that settlement didn't cause any movement. On this occasion a 4 x 5 inch camera was being used that had considerable movements of the lens and film plate unobtainable in smaller formats. This meant that the equipment could be arranged to avoid such features as the convergence of the pine trees in the mid-ground. A particular feature of the scene that Adams wanted to capture was the swirling cloud passing above the trees and in front of the cliff, for all his visualization experience (this picture was taken 41 years after his first successful application of the technique) the behavior of such cloud was unpredictable. About six negatives were exposed on normal film and then several more on Polaroid film that produced a negative and positive at the same time. Adams was unusual in that he liked using Polaroid film and took it very seriously. More commonly professional photographers considered it as a useful tool to get an instant idea of lighting effects particularly in studio shots, but not really anything to use for the final image. For many years he was a technical consultant to Polaroid. Such was Adams approach to image making that he tried to process his negatives in chemicals that he had in the car to see the result and re-take if necessary. As it was, the temperature was too low for any realistic development and he eventually carried out the development back in his darkroom. The Polaroid film could not be controlled during development as could the ordinary negative stock, though despite applying all the expertise he knew how and printing Polaroid and standard (Kodak Tri-X in this case) negatives, in this case the most satisfactory result was obtained from the Polaroid negative. This is what was used for the printing of the final image, though of course with the usual characteristic control of all of the variables of that process including different papers and a particular cocktail of proprietary developing agents. This image is also a good example of how one photographer would develop an image to show a scene differently to another. The picture has received comments that the trees are rather dark. If one were present at the scene, they will have been lighter than they are shown here in relation to the rest of the view. Adams manipulation of this shows how he was able to bring about his own visualization of the scene to give the effect that he wanted. As he says himself when writing about the image, "In an overpowering area such as Yosemite Valley it is difficult for anyone not to make photographs that appear derivative of past work. The subjects are definite and recognizable, and the viewpoints are limited. It is therefore all the more important to strive for individual and strong visualizations."